Arahne CAD/CAM for weaving | How to spot a genuine newcomer in politics? Arahne CAD/CAM for weaving / News / How to spot a genuine newcomer in politics? In turbulent times, people get tired of established parties and prefer “new faces”. But how can you know, if the new candidate is really new? We can use our knowledge of textiles and mathematics. 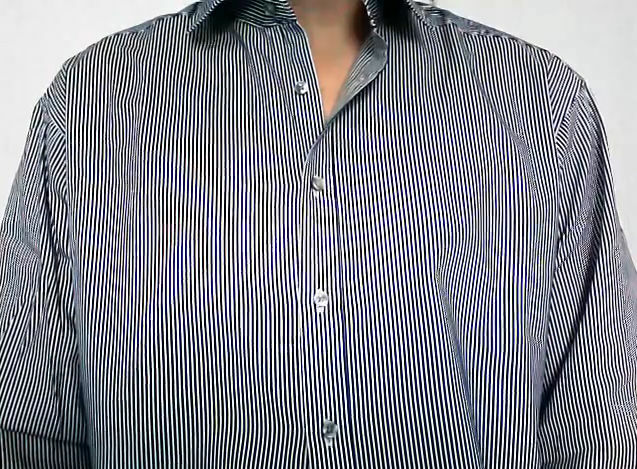 If a candidate wears stripes on TV, he or she will look horrible due to Moiré patterns, interference of fabric stripes and raster resolution of the camera. You can enjoy it in full motion on this youtube video. We have greatly improved over our previous results. On the left, you see a tapestry weave colored in yarn colors, and on the right, you see just the black and white weave card (black – warp up, white – weft up). Tapestry weave is very big, 11492×4662, and we wish to make a precise and accurate fabric simulation, zoomed out 16 times. On the left, you have our previous simulation, full of unwanted Moiré patterns, and on the right, the new one. Fabric courtesy of Pure Country Weavers. Now we can use ArahWeave to generate very accurate fabric simulations for use in catalogs or e-commerce web sites, based on production data (jacquard card file), not on product photos. How can we apply our expertise in Moiré patterns on politics? If your preferred political candidate appears perfect, speaks smoothly, just what you want to hear, and never wears stripes for TV confrontation, don’t trust that person. He or she has been planted by the “old forces”, trained by spin doctors and fashion advisers. They will show their true colors, once elected.